This is a scrumptious burger recipe using Jovian Pantry® V Spice Seasoning. It is topped with sautéed mushrooms and caramelized onions. If you don’t like mushrooms, leave them off; if you don’t like onions, leave them off; if you can’t stand both then we have a really delicious Caramel Braising Sauce you should try!!!! 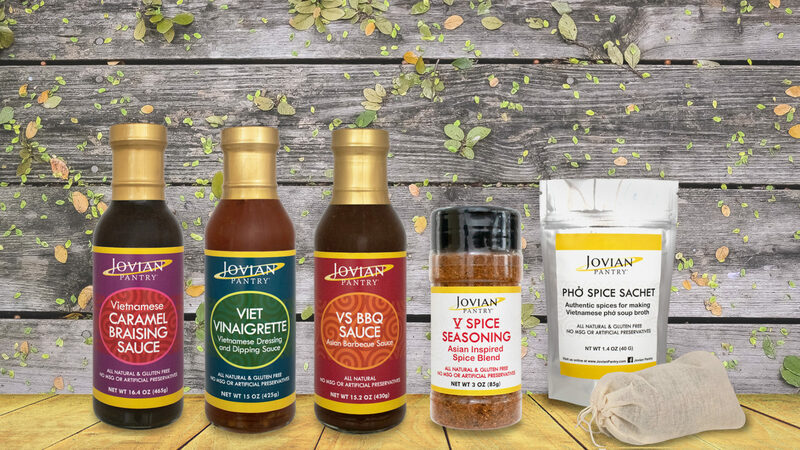 3 tbsp Jovian Pantry® V Spice Seasoning; 2 tbsp to mix in and 1 tbsp to finish the burgers with. In a large bowl mix together the 2 types of ground beef with 2 tbsp of V Spice Seasoning. Peel the onion and cut in half. Using a small grater, grate in 2 tbsp of onion and onion juice into the burger mix, add Worcestershire sauce and incorporate it well. Let the burger mixture rest and slice up onions and mushrooms. Heat up a pan with olive oil, then add onions, cook on medium heat till onions are caramelized and add mushrooms to pan. Cook onions and mushrooms till the mushroom juices have reduced to a thick consistency. Salt and pepper to taste. Form 5-6 patties out of burger mixture then grill till cooked to your preference. Please remember that well done = hockey pucks!! Before flipping burgers sprinkle on the remainder of V Spice Seasoning. The heat will release the aromatics and make your mouth water. Build your burger to your desire and enjoy!